I got the idea for this from my friend, Dee, over at Tea With Dee. She blogged about a contest put out by Blogelina – a contest of sorts for the best (or worst) blogging spot. I don’t know if I will actually enter said contest, but I am rather snoopy & I think it is fun to see where everyone blogs from. I will take my cue from Dee to say that only one photo is necessary for the contest, but I took several, trying to get the best angle. The simple close-up. I have a small collection of band-tailed pigeon feathers floating on the base of the lamp, gifts left in the lawn for me by the pigeons when they raid the feeder. A stone marble. A trio of candles that I rarely light. My faun horns hanging off the side of the monitor. Kindle charging and address book arop that. My notepaper in the decorative box. A pair of 18″ rulers lurking to the side because I also occasionally lay out artwork on my desk. The long view shows some of the things I have hanging on my wall – things I enjoy looking at, from the curio cabinet to the pair of Unknown Artist paintings in a single frame. Memorabilia I brought home from my dad’s house when he passed away two years ago: a banner from my host Lions’ Club in Sapporo, Hokkaido, Japan (I spent six weeks with a wonderful host family there). Attached to the banner is the pin my dad handed out when he ran for Nevada State Senate (and lost): BACK JACK. 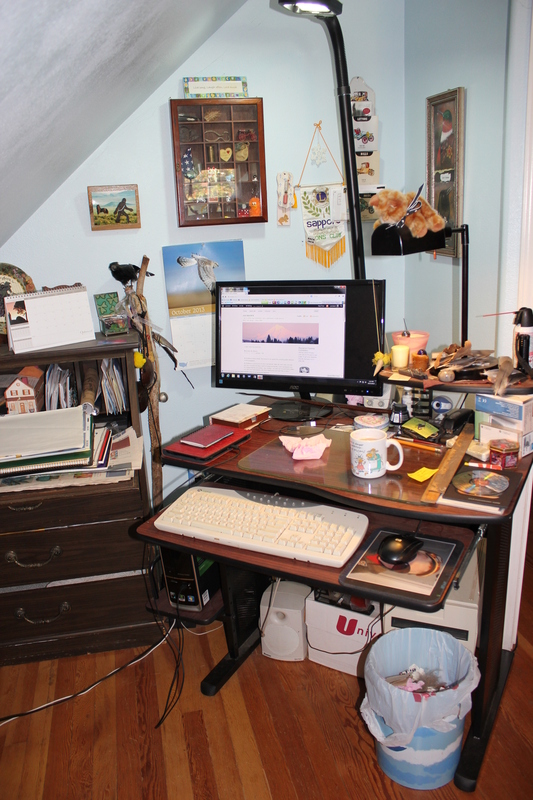 My blogging space is in a corner in the upstairs non-bedroom that I turned into my studio when my last fledgling flew from home. 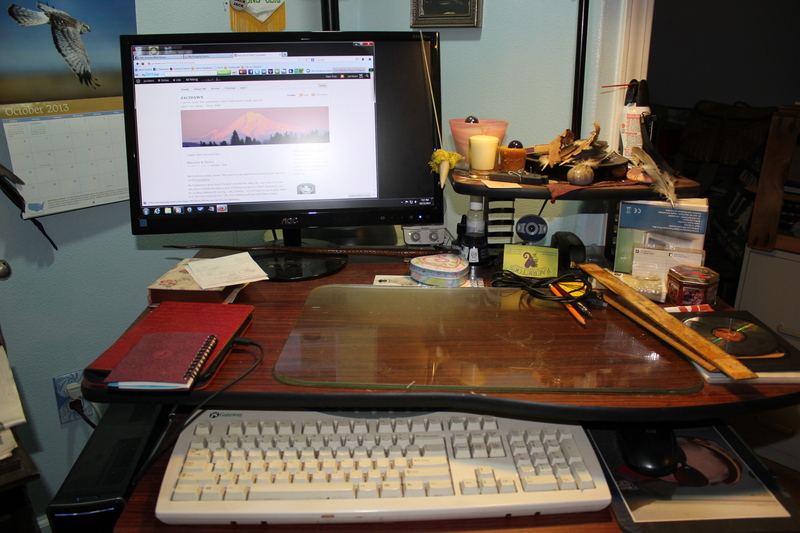 It is where I pay bills, so the little writer’s desk/bureau to the left is essential for organization. It is also full of stationery and cards. My walking stick that I made the year my mother died, titled Two Crow Feather Woman. Two calendars – one for the birds and one to write birthdays down on. A funky decopupage item that my youngest gave me for Christmas that shows a Wookie crossing the desert in front of a startled wild horse. I believe it is titled “The Original Bigfoot” and I love it. My space is in a tiny corner of the second floor of our Cape Cod, hence the slanting ceilings. I painted the walls two shades of blue when I moved up here. It gives a sort of cloudy blue skies feel to the room, which makes me feel calm. 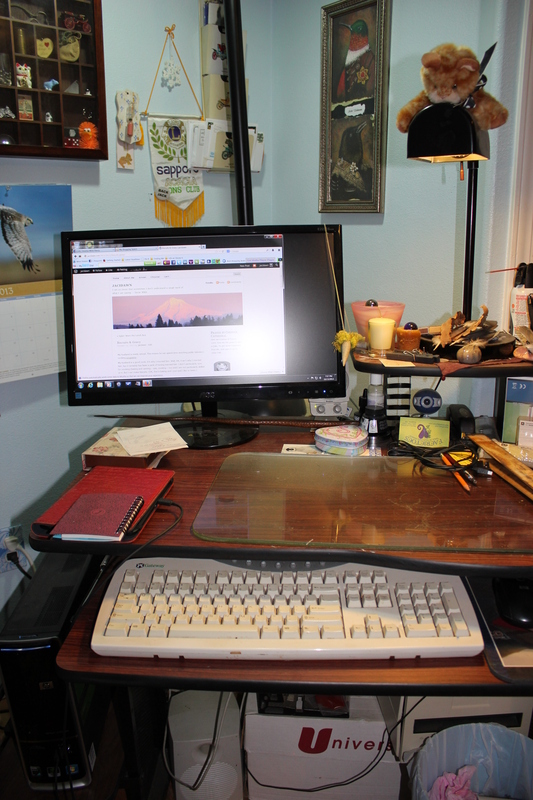 I’d love more room, but I do with what I can – hence the cords on the floor leading to my scanner. The printer is a wireless one & is downstairs. And, yes, I have boxes shoved under my desk – CD-Roms and genealogy notes. And that is my space.